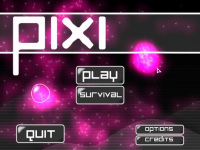 Playing Pixi is playing with colorful light and the shapes of circles, boxes, and stars. The main task is to control the flow of colorful light that comes from the circular bubbles and direct them through the boxes to eliminate them. The stars are the targets to defend while the boxes are to be eliminated from the screen. The boxes will take the stars away, so keep them away from the boxi. At the end of each level, a powerful boss is waiting for you. Play guitar with your computer keyboard as accurately as possible. Help Papa Louie satisfy customers by cooking hamburger perfectly.